Gabbro, a hard, black rock that forms by slow cooling of the molten magma trapped beneath Earth’s surface has been discovered for the first time under intact ocean crust. 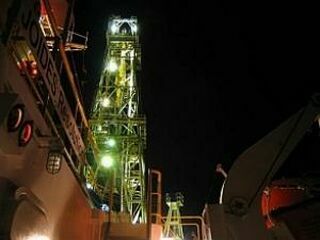 It is aboard the research drilling ship JOIDES Resolution, scientists have drilled into a fossil magma chamber 1.4 kilometers beneath the sea floor. Boring that deep is no joke! The drilling took five long months. Twenty-five hardened steel and tungsten carbide drill bits were required to complete the job. (Getting there) is a rare opportunity to calibrate geophysical measurements with direct observations of real rocks.